I generally cook recipes with chicken breasts, but once in a while I like to switch things up. Honey-drizzled chicken drumsticks are tasty, simple and budget-friendly. The chicken is baked, not fried, with a touch of sweetness. Besides the chicken drumsticks, the ingredients are all typically stocked in the pantry. This dinner doesn’t take much time to assemble, but it does take time to bake. Plan for a whole hour to assemble and cook in the oven. 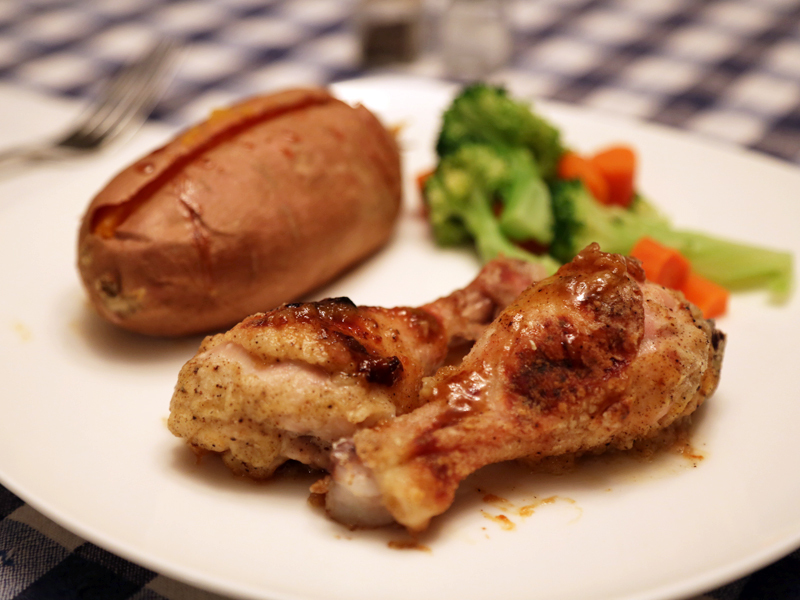 I like to serve the drumsticks with sweet potatoes and vegetables. Mix together dry ingredients in a bowl. Coat the drumsticks in the melted butter and then the dry mixture. Place the drumsticks in a lightly greased baking dish. Lightly drizzle honey on top of the drumsticks. Bake for 50 minutes or until fully cooked. Bake whole sweet potatoes as a side dish while the chicken cooks. No Replies to "Honey-drizzled chicken drumsticks"